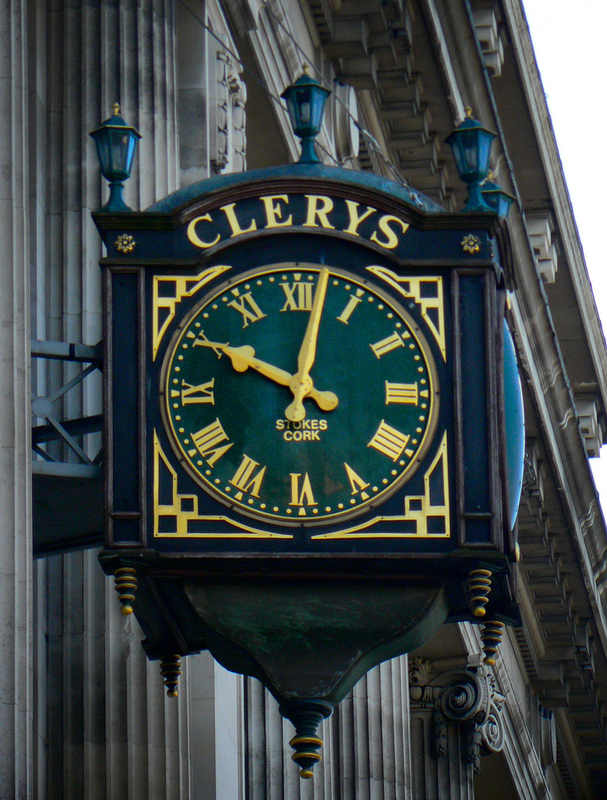 D’oscail Clery’s a doirse an deireadh seachtaine seo tar éis ceithre mhí de athchóiriú agus athnuachan. Rinneadh damáiste tubaisteach di de bharr tuillte tobann a scrios gach urlár de ceann d’fhoirgnimh siopadóireachta is sine san Eoraip. Anois tá an foireann oibre de 87 duine ar ais ag obair agus gliondar chroí orthu bheith páirteach i bhféile na Nollag na bliana seo. I mí Iúil na bliana seo nuair a chrochadh an fógra “Damáiste Uisce Déanta” i bhfuinneoga Clery’s, cheap daoine gur rud beag a bhí ann. Níor thuigeadar gur thárla maidhm thuile an oíche roimh ré, a bhris meáchan na huisce ar an díon giarsa iarainn, agus gur seoladh 400 go 500 galún uisce tríd chroí an fhoirgnimh, ag scriosadh siléirí, úrláir, soilse agus an córas leictreachais acu. Tá an oscailt seo ag tarlú díreach in am do shéasúir na Nollag, agus an dóchas ann go meallfaidh sé cuairteoirí is tacaitheoirí araon le earraí a chéannacht i gcomhair an tréimhse trádala is gnóthaí den bhliain. Tá cáil agus meas tuilte ag Clery’s go háirithe ag an Nollaig mar áit a cheiliúrann an Nollag go spleodrach – bíonn cór ag canadh ón staighre breá bhán acu ar chúl, bíonn maisiúchán lonrach is ildaite á chrochadh as an síleáil maisithe, agus bíonn earraí Éireannacha ar thaispeáint agus ar dhíol go bródúil agus go trean acu. Tar éis an oscailt nua tá an atmaisféar iontach ceánna fós le brath – is deacair le creidiúint go raibh briseadh croí ann na míosa roimhe seo. Tá 160 bliain caite ó a osclaíodh an fhoirgneamh don chéad uair – Éirí Amach 1916 i measc na blianta fada sin – agus tá Clery’s fós ina sheasamh. Ní amháin sin ach tá siad tar éis maireachtáil tríd cúlú eacnamaíochta na tíre seo, d’ainneoin bheith curtha faoi ghlacadóireacht an bhliain seo caite. Fós féin, seasann Clery’s mar nasc le stair na príomhchathrach. Taispeáineann an athbheochan álainn seo thar aon ní eile go bhfuil siad anseo le fanacht agus ullamh le athrú.